The massive popularity of 1996's Pokémon Red and Blue has cast a long shadow over the Pokémon series. Much of the fanbase believes in the superiority of the original 151 monsters, and given 2016’s Pokémon Go phenomenon—which only had the initial cast—who can argue? With the newest Pokémon games, Sun and Moon, Game Freak plays nice with that reality, inviting fans on a vacation that celebrates (yet also reinvents) what people love about pocket monsters. 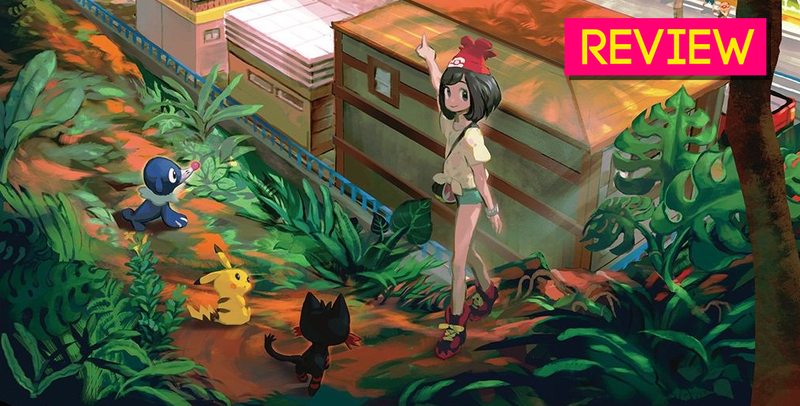 In Sun and Moon, you play as an 11-year old boy or girl who moves from Kanto, the locale of the original games, to a tropical paradise known as Alola. It’s a small yet telling narrative decision that illuminates the pitch Game Freak is making toward O.G. fans: what you loved isn’t being discarded; it’s just getting a twist. The Alola region is composed of islands with different environments and climates, allowing many classic Pokémon to now have ‘regional variants.’ That fire Pokémon you loved as a kid? It’s an ice Pokémon now, with a way cooler design to boot. Remember that amazing monster that used a bone as a weapon? It’s a GHOST now. And if you don’t know the first 151? That’s okay, you still get the more awesome versions of beloved creatures from the get-go, all while exploring a virtual eden. It’s a smart compromise that makes the old new again. The Alola region presents Pokémon-training as part of deeply-rooted tradition. In older games, it never quite made sense for little kids to become dog-fighting nomads. In Sun and Moon, that journey is explicitly a coming of age ritual, and it has been performed through generations of people. Picking a starter monster and acquiring a rival feel less like a Pokémon convention and more like a cultural practice based in history. That grounded premise, coupled with Pokémon Sun and Moon’s attention to detail, makes the world feel alive. You can hear Pokémon chirp and croak. They hang from trees and scutter about as you make your way through tall grass. Some computer-controlled characters still set out bowls, beds, and toys for their own house-bound pets. The more professional ones use a variety of monsters to help them with day-to-day jobs, like construction or police work. Pokémon don’t feel grafted on here. They feel like a meaningful part of an actual society. As always, the bulk of these new Pokémon games is spent fighting through turn-based battles. Some start from random encounters. Others you initiate against trainers such as yourself. In the wild, you can capture more creatures to join your starter, with up to six monsters making up a team. Each creature has strengths, weaknesses, and a moveset, along with an overarching elemental affinity. With over 700 Pokémon in the roster, hundreds of potential moves, and 18 elemental types, even veterans might have a hard time keeping track of it all. Sun and Moon lend a helping hand here: once you use a move against a foe, the game’s menu will remind you of effectiveness before you select anything. Sun and Moon are structured around “trials” scattered throughout four islands, and these challenges might require you to do anything from photography to acing a quiz. Inevitably all trials incorporate battles, but pulling away from the usual gym framework revitalizes Pokémon. Instead of doubling down on the seriousness of a major battle at the end of a gauntlet, as prior games did, trials often amused and entertained me with their antics. I never knew what to expect, which makes trials infinitely more memorable than gyms. The trial arrangement makes Sun and Moon more streamlined, too. You always have a clearly defined path and purpose during your travels. In practice, Sun and Moon opt for more regular battles of note against important characters, rather than endlessly throwing random combative NPCs against you. The beats you come to expect from a Pokémon game, like the inevitable showdown against an evil collective, still happen—but Sun and Moon get to the point quicker, and with more charm. The new games ooze a confident charisma that’s noticeable in everything, from rainbow-colored text, to the jokester Pokedex with a mind of its own. In other games, the go-to “strategy” against AI was to grind your Pokémon, so as to overwhelm through sheer stats. In Sun and Moon, it is not enough to over level your creatures, or even to use the correct move type. Trainers use more items that heal HP or status conditions, and in the wild, monsters often call for “help,” so that more Pokémon can join them during battle. I’ve played Pokémon games since Red and Blue and have never had my team faint or come close to collapse as often as I did in Sun and Moon. The new games forced me to use actual tactics against the computer. For once, the single-player in a Pokémon game made me care more about movesets, turn order, and team make-up. It’s a thrilling change that highlights the complexity underlying a series that is jokingly referred to as a children’s game. Sun and Moon also introduce a few new asides, though I was disappointed by their lack of consequence. For instance, you can now take photographs of wild monsters, a la Pokémon Snap, but the scope is limited and the scoring for creativity is terrible. All the photographic feature wants you to do is to take close-up pictures where the creature is centered. Short animation loops means that once you’ve snapped a few pics, there’s not much to do anymore. Boring! Worse, despite actively looking for photography spots, I only found a few in my dozens of hours of playtime. “Festival Plaza” introduces a social hub where real trainers can purchase items and interact with one another, Miitomo-style. While the presentation is nice, there isn’t much to do. “Pokémon Pelago” will likely prove to be the most useful of the bunch, as it provides players with private islands where Pokémon can hang out, collect items, train, and even encounter wild monsters. Pelago Island development is tied to the number of Pokémon you own, which is a sharp way of motivating players to capture more creatures. Even so, I found myself repeatedly trying these features for the sake of review, and none of them felt fun. Even the hyped Z-Moves featured in much of the advertising left me cold: sure, they’re flashy, but they’re just souped-up moves. Nothing groundbreaking. Instead, the additions I appreciated the most were subtle, quality of life details. Pokémon now warns you when you’re about to aggro an NPC into battle. Instead of being useless permanent moves, HMs have been replaced with “charges” that let you call a Pokémon to aid you with stuff like surfing and flying. If your buddy gets a status ailment during battle, instead of wasting an item you can just perform some battle aftercare to treat their illness. While none of these inclusions are revolutionary, they work together to bolster the solid battle mechanics. While the systems at the heart of Pokémon are largely familiar, Sun and Moon spark plenty of intrigue. After finding an unknown monster from a different dimension, you set out to find out more about where it hails from. This is how Sun and Moon introduce the stark and mysterious ultra beasts, whose motives and even nature—are they Pokémon?—are unclear. Sun and Moon are the rare Pokémon games where I cared about uncovering the story, and I say this despite the simplistic and mawkish writing. On a smaller scale, I always felt motivated to discover more Pokémon, curious to see if any of my favorites had been revamped. Alolan forms such as Dugtrio with long, luscious hair, or an Exeggutor with a hilariously long neck show Game Freak clearly having fun with Pokémon designs. The fully-new Alola-exclusive Pokémon are also well-designed. Creatures like haunted sandcastles and toucan-inspired Pokémon take Alola’s setting seriously, but few got me excited in the same way the regional variants did. I caught myself keeping teams of mostly old Pokémon until I made an effort to focus on the new cadre. To Alola’s credit, I’ve learned to love them, too. Shout out to Rockruff and Bewear, two Pokémon that are cuter than they have any right to be. I’ve spent more time than I care to admit trying to engineer a team that’s both competent and awesome. Earlier this year, I spoke to lead Pokémon developer Junichi Masuda about the legacy of Red and Blue, and asked him whether or not Game Freak felt pressure to cater to fans who believe the originals are the apex of the series. Masuda laughed, acknowledged the tension, and told me that of course he didn’t want to disappoint anyone, regardless of whether it was a newbie or veteran. “We want to live up to the expectations of the fans,” Masuda said. At the time it seemed like an obligatory answer, but after playing through Sun and Moon, I see that it was not just an idle response. Sun and Moon pull off a delicate juggling act. For 20 years now, Pokémon games have presented fantasies where people live, battle, and grow alongside powerful monsters. In Pokémon Sun and Moon, that wistful reverie invites you take a holiday, leave your worries behind, and grab yourself a lei. As it happens with all good vacations, Pokémon found itself again.